A federal judge has erased New England Patriots quarterback Tom Brady's four-game suspension for "Deflategate." The ruling by U.S. District Judge Richard Berman came after more than one month of failed settlement talks between the NFL and its players union. The scandal erupted after the AFC championship game in January, when officials discovered during the first half that Brady used underinflated footballs. An NFL investigation led to Brady's suspension, which Commissioner Roger Goodell upheld. Reaction is pouring in from Patriots Nation, but perhaps none are more excited than a husband and wife who can finally go on their honeymoon. 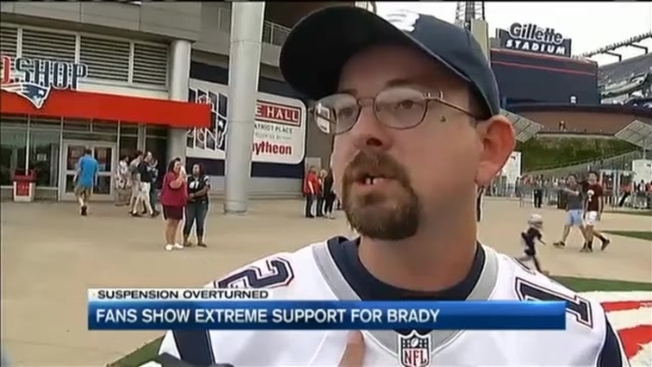 Paul and Kellie Goodrow, who told necn back in May that they wouldn’t go on the trip until Brady was cleared. "Now we're going," said Kellie Goodrow. The newlyweds said they wanted to take a stand. "I knew it was going to get lifted. That's why we put it off," said Kellie Goodrow, who added that they'll be going to Bermuda. 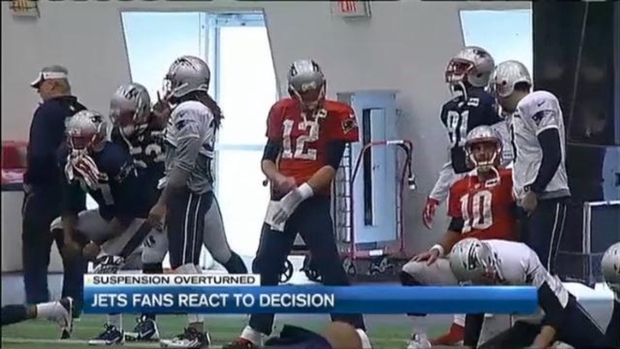 People calling into 98.5 the Sports Hub celebrated the overturning of Tom Brady's 4-game suspension by the NFL. They weren't the only happy ones. 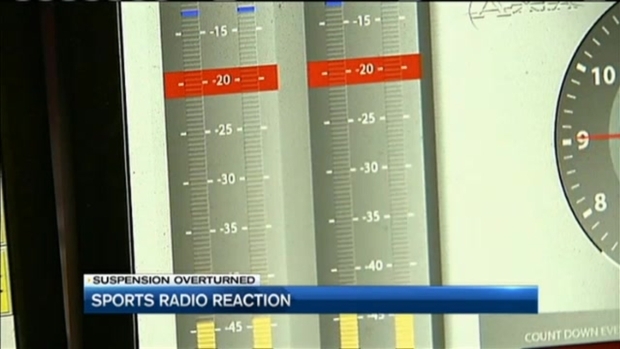 Caller after caller into 98.5 The Sports Hub expressed excitement at the ruling. Boston Mayor Marty Walsh later released a statement reading: "Today is a great day in New England and a Patriots fans across the country are celebrating. Now, let's get back to football - I am looking forward to a great season and cheering on the Patriots one game at a time." A man who flew a banner over Roger Goodell's Maine house and another who chanted "Free Tom Brady" when he ran into him at a supermarket were among those excited that Brady's four-game suspension was lifted. 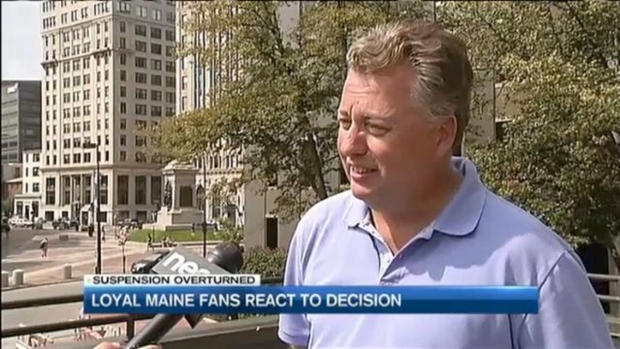 In Maine, where Goodell has a summer home, residents were jubilant. One man, who flew a plane with a banner criticizing Goodell's decision, was cryptic on his future plans. "Keep your eyes peeled to the sky," said Richard Pate. "There may be one last word to Commissioner Goodell." Mike Marcello, who ran into Goodell at the Hannaford in Scarborough and chanted "Free Tom Brady," was elated. "It's the passion," he said. "That's what it's about, the passion is amazing." In Lewiston, a Dunkin' Donuts thanked Berman for his ruling. A Dunkin' Donuts in Lewiston, Maine, thinks Judge Richard Berman for his ruling to wipe Patriots quarterback Tom Brady's suspension. Similarly, McGreevy's, the sports bar of Dropkick Murphys frontman Ken Casey, pledged free service to the judge. While many supporters of the Patriots' chief division rivals have a personal disdain for Tom Brady, many of them were glad to see him come out on top of the NFL when Judge Richard Berman overturned his four-game suspension. Even some Jets fans were happy, their feelings for Goodell outweighing their disdain for Brady. "Take that Roger Goodell," says Matthew Rivard. "Vindicated. Period," says Barbara Hopey. "Yay!! No evidence, no case," says Mary Lou Lincoln Hastings. "Love it. TB 12 is free. Goodell is looking for a new job. I hear the McDonald's is hiring. Giselle come back," says Rick Gibbons. "YES!! YES!! YES!! Brady freaking WINS," says Joe Dobrowski. "My day is made to perfection. Hooray for Tom Brady and Patriots. Gotta love this day," says Christine Curtin. "In Tom we trust," says Rita Ladanyi. "Oh well. Now I guess that the Colts, Ravens and Jets will just have to beat the Patriots on the field. Not gonna happen," says Scott Fabian. "Nice!!!! In your face Roger," says Sandy Furman Bernstein. "Knew it!!! But, how long before the next witch hunt begins," says Michelle DeMange. "Haha. Fear #12," says Steve Stevenson. "Bring on the duck boats," says Cheryl Ann. "Yay! I believe Brady quite frankly that he was unaware that a few of the game balls were a tad under-inflated. Plus the cold, wet day will naturally reduce the air pressure in the ball," says Marc Richardson. Great and right decision on #tombrady Go #Pats.